Publisher's blurb: "Somethings are not always what they seem... is it a knickknack, or something not so mundane? "Why's that candle so special? How come that piece of chalk is kept separate from the others? There's something uncanny about that lantern, and what is it about that odd whistle? "There are always the iconic magic items, be they swords, armors, cloaks, rings, or other traditional things. But these are those other items, those simpler things, that just a potent, yet lesser thought about. Crafters of powerful items are individuals, first and foremost, and we all have our quirks and curiosities. 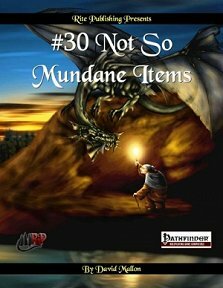 "#30 Not So Mundane Items allows for memorable moments, unique items, that fill not only a need as treasure, but also one of the shared experience or story. Infuse your play with something just a bit different."